The Great Wall at Gubeikou, Miyun, Beijing. Explore the Great Wall with us. Step off the tourist trail and hike the ‘wild’ Wall, with trips from Beijing to secluded and scenic sections of China’s old frontier. On the way up a pilgrim’s trail, Haidian District, Beijing. Since 2001 we’ve found and maintained more than 100 different hiking trails in the hills around Beijing. Mountains high, valleys low, rivers long … discover what Beijing is like outside the big city. A mountain village in Danzhai County, Guizhou Province. From Silk Road deserts to mountain paths, from ancient ruins and traditional culture in mountain villages to the stunning scenery of the Zhangye Danxia Landform—join our active trips and really explore China. Meeting with a Daoist monk, Haidian District, Beijing. small country villages, plus forests, rivers, mountains, and more. Ready for a great hike? Every week we run hikes and trips to the Great Wall, hills, mountains, forests, and villages around Beijing, with a wide range of hikes that are suitable for casual walkers as well as the super-fit. Level 4 / 390 RMB – A tough Great Wall hike over tricky terrain in a remote area of northwest Beijing, with a lot of ups and downs on the way to the end. Note: this route features steep descents on loose footing—if you’re not good with heights and balancing, you will not enjoy this hike. Level 3 / 1,690 RMB (1,520 RMB for members) – Camp overnight in a tower at the Gubeikou Great Wall, and hike on to Jinshanling the next day. You’ll hike easier with just the essentials in your day pack; we’ll arrange delivery of the camping equipment to the campsite. Level 3+ / 430 RMB – Walk both restored and unrestored sections of Great Wall on the way from the Huanghuacheng Reservoir all the way over to the Xishuiyu Reservoir. Some sections steep! Level 3 / 380 RMB – Hike hill trails and valley paths to on the way to Shuiquan Canyon, a bouldery valley in the Longquanyu area. Level 3+ / 420 RMB – After a reasonably tough hill climb of 40–50 minutes, we reach a beautiful, unrestored stretch of Great Wall. The hike continues along the wall, passing through towers, finishing in a rustic village. Level 4+ / 360 RMB – A variation of our Vulture Rock Ridge Loop hike, finishing on the Beijing side of the hills instead of completing the loop. Great views and hill climbing exercise. Level 3+ / 430 RMB – Hike the Great Wall in the afternoon, and then see the sun set from a lookout point on the wall above the Huanghuacheng Reservoir. Level 3 / 450 RMB – A relatively easy hike along an unrestored section of the Great Wall that grants magnificent views of the Great Wall stretching beyond the horizon in the east and west. In Brief: Travel by foot and jeep through the desert, visit desert lakes, ride camels, camp in the desert, and more. From 8,060 RMB*, all-inclusive. In Brief: See the fantastically-coloured mountains and cliffs in an all-but unexplored area of Gansu; visit Horse Hoofprint Temple, Jiayuguan Fortress, and more. From 11,100 RMB*, all-inclusive. In Brief: Clean and cool grasslands near the border of Hebei and Inner Mongolia: hikes, BBQ lamb, and more. From 1,710 RMB*, all-inclusive. In Brief: Two high-altitude hikes at the grasslands and glacier of the Amne Machin Snow Mountain, and visits to Tibetan temples and markets, including Xining’s Kumbum Monastery. From 12,500 RMB*, all-inclusive. In Brief: See the Labrang Monastery, Tibetan Buddhist temples, and super high mountain scenery on this trip to the largely Tibetan remote area of Gansu Province. A similar feel to Tibet, without the hassle of getting the official permit. From 8,930 RMB*, all-inclusive. 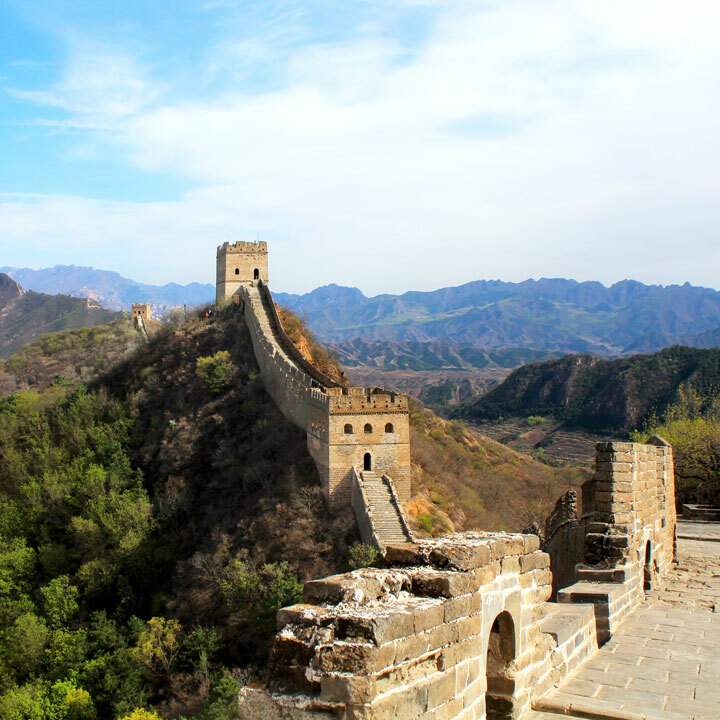 Find out how we can make it easy for you to take friends, family, students, staff, and co-workers for a day out at the Great Wall and other scenic areas in Beijing. From 600 RMB* per person, all-inclusive – Enjoy a moderately difficult Great Wall hike on mostly unrestored ‘wild’ Great Wall, with photo opportunities for postcard-perfect shots of long stretches of wall and towers. From 550 RMB* per person, all-inclusive – A short-but-steep walk where you’ll see a mix of unrestored ‘wild’ Great Wall as well as a restored section, with superb views of Great Wall, mountains, and lakes. Reward the team and show them a good – and healthy! – time out in the countryside. We'll help you choose a hike that suits the fitness level and interest of participants, and we can arrange a giant meal of country-style cooking at one of the many countryside restaurants that we know and love. Beijing Hikers has been leading hikes and trips around Beijing & greater China since 2001. With us, you'll explore interesting and hard to reach places, hassle-free and friendly. See an overview of all the scheduled hikes and trips in our calendar. Read our trip reports and get an idea of what it's like to hike with us; view collections of photos from hikes and trips; read news about Beijing Hikers. An alternate trail at Stone Valley took us through patches of pink flowers and green leaves, making the hike extra pretty—see 30+ photos. See 29 photos from a camping trip up on the Switchback Great Wall—gloomy skies, chilly weather, and colourful scenery. 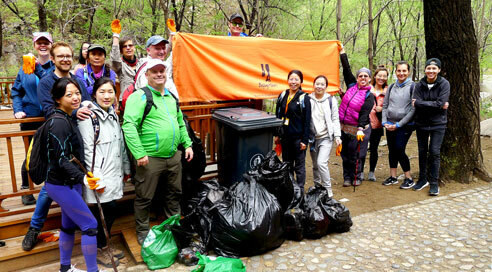 See a set of 39 photos from our 2019 Earth Day clean up hike at Shuiquan Canyon. The skies went from cloudy to clear while we were hiking over to the Great Wall at Jinshanling—see a super set of 55 photos. What’s happening with the Jiankou Great Wall as at April 15, 2019? An easy hike at the Gubeikou Great Wall, followed by fun at the Gubeikou adventure playground—take a look at 19 photos from the Kids Club hike. 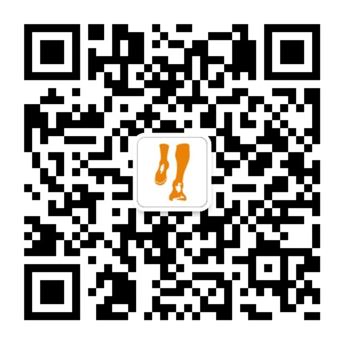 Scan the QR code to add Beijing Hikers to your Wechat contacts. We send a weekly update with photos and the hikes for the week. You can also find us in Wechat by searching for BeijingHikers.